Messy microwave? Want to get it clean with minimal effort? 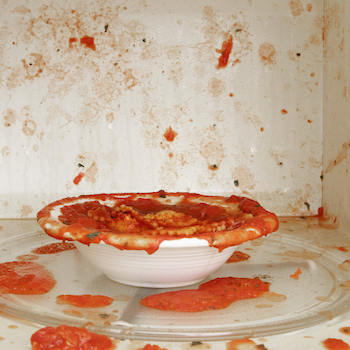 Here’s the easiest way to get a sparkling clean microwave – without nasty chemicals. Step 1: Combine ¼ cup of white vinegar and 1 cup of water in a glass bowl. Zap the mixture on high for 5 minutes. Step 2: Wander off and leave the it to do it’s thing for a few extra minutes. This will allow the steam to soften up the baked-on grime. Step 3: Use the warm vinegar and water mixture to wipe away all the stains and splatters in the microwave and it will give you a nice streak free exterior too. Using vinegar will eliminate any lingering odours and disinfect. Not only does the vinegar do a great job, it’s totally non-toxic! So you don’t need to worry about any potentially harmful fumes mingling with your food. This entry was posted in Recommended and tagged Cleaning tips. Bookmark the permalink.